I'd like to demonstrate a the last two of these features using the new Python API. Starting and stopping recording is easy. The following snippet demonstrates starting recording on all cameras with the predefined compression settings named 'high' (see the Web UI for the names of your configured compression formats). The recording will run for 5 seconds and will have have the additional metadata 'experiment' and 'genotype' saved to the recorded file. The snipped works equally on single or simultaenous multiple-camera systems. Likewise, the API also supports defining scheduled tasks, this allows for example, to schedule recordings and their subsequent copy to storage to occur at specific times. Task scheduling re-uses Cron syntax with some extensions (monotonic tasks). 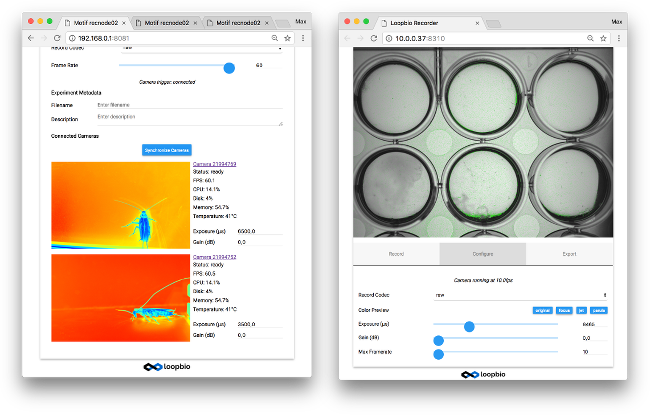 We are really excited about these new API feature as they allowa laboratory wide automation of single or multiple recording systems or experimental assays. We are looking forward to extending our API support in future releases.